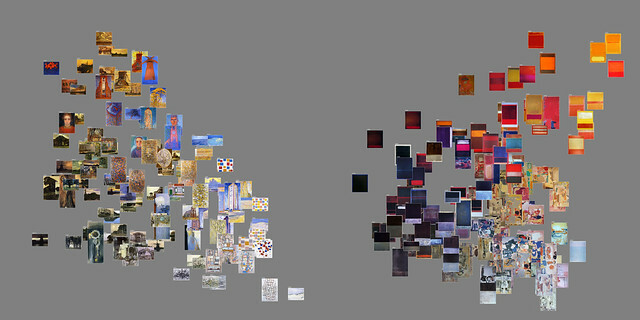 Comparison between 128 paintings by Piet Mondrian (from 1904-1917) and 168 paintings by Mark Rothko (from 1934-1970). Visualizing patterns in art, photography, cinema, TV, animation, print media, games, comics, maps, and user-generated content. The explosive growth of cultural content on the web including social media and the digitization work by museums, libraries, and companies since the 1990s make possible fundamentally new paradigm for the study of both contemporary and historical cultures. We can use computer-based techniques for data analysis and interactive visualization employed in sciences as well as the artistic techniques developed in media and digital art to analyze patterns and trends in massive cultural data sets. In 2007 we have established Software Studies Initiative (softwarestudies.com) at University of California, San Diego (UCSD) and California Institute for Telecommunication and Information (Calit2) to begin putting this vision into practice. Cultural analytics presents a new opportunity for digital cultural archives which today typically provide only search interface for the users. Instead, we can explore the collections of any size using new visualization techniques to reveal interesting cultural patterns which until now escaped the attention of researchers and curators. I will show examples of our visualization of art, photography, film, animation, motion graphics, video games, magazines, web sites, and other visual media. This work is done in colloboration with The Getty Museum, the Austrian Film Museum, Magnum Photos, Netherland Institute for Sound and Image, San Diego Museum of Contemporary Art who were interested to use our methods to explore patterns in their media collections in new ways. The presentation will include our largest project to date - analysis and visualization of 1,000,000 Manga pages.